ACOSAR responds to a strong market request in a plenitude of industrial domains: a consistent, seamless (virtual) system development / system validation. For this, ACOSAR uses a modular co-simulation approach, supporting flexible system development by its modular characteristics, to integrate domain-specific subsystems. However, in development stages, where RT-Systems have to be integrated into simulation environments, huge configuration effort is still necessary. ACOSAR will focus on the specification of a non-proprietary open RT-System interface, a so-called “Distributed Co-Simulation Protocol” (DCP), for sharing relevant information for efficient and safe operation of RT-Systems, e.g. test beds. A communication architecture (incl. protocol) will be set up, which will be basically independent of the communication systems actually used. A functional framework for coupling strategies, highly efficient data transmission and supporting semantic data processing, will supplement this. Furthermore, a comprehensive methodology for seamless integration of RT-Systems during the late phases of the classical V-model development cycle (verification & testing, validation) will be defined. 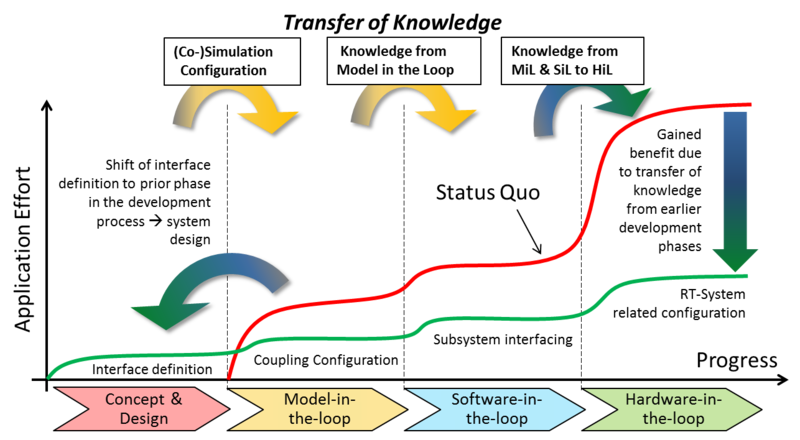 This methodology supports existing tool chains, model-based system engineering approaches, methods for easily adapting simulation tools from early development phases to late ones, and transfer of knowledge. The open ACOSAR DCP not only makes it possible to extend simulation cloud-based applications towards the real-time domain, but also to select and apply “best-in-class” RT-Systems to compose a dedicated optimum overall system for specific problems present (e.g. interconnection of distributed HiL test beds for specific engineering purposes) with reduced error proneness. Besides spreading such kind of ICT solutions for the benefit of other domains, this also will help improving the social acceptance of new technologies, e.g. with regard to autonomous driving. Furthermore, research on smart functionalities incl. adaptive coupling strategies will be stimulated. The major results of ACOSAR will be freely available (DCP specification including a methodology for integration and a functional framework for new functionalities enabling enhanced competition). Thus, ACOSAR contributes to interoperability, open access and supporting competition, and will lead to a modular, considerably more flexible as well as much shorter system development process and will enable new business models. Transfer of results into standardization is the key goal of ACOSAR. Therefore, partners from relevant standardization committees (Modelisar/FMI, ASAM) will be involved to jointly create solutions and extensions to existing standards. To further bridge the gap between the automotive domain and other domains, leading partners from e.g. aviation and rail will be invited to ACOSAR as associated members. Not at least, ACOSAR innovations will enable SMEs and suppliers (tools, HiL systems …) from different domains to get access to major industries leading to a more competitive market on the long term.